HTE Automation is the regional leader in supporting local manufacturers exceed their production through-put goals. Our focus is on delivering proven, rapid ROI equipment solutions, whether they be individual robot, PLC, HMI, or other discrete solutions, or a complete work-cell that will accelerate your established processes. 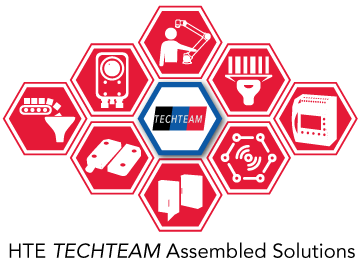 Our HTE TECHTEAM is an ad hoc approach to solving factory floor challenges. It is a team comprised of HTE engineers and technical support staff who work with engineering and technical departments at our industry leading equipment suppliers, and your technical and/or production staff. We use advanced technology solutions to overcome persistent production problems, and to meet the demands created on your plant floor by growing customer demand for variety in your end-products, and rapid delivery of customized items. Robots, Machine Vision, Product ID, Conveyors and Parts Feeders, Programmable Logic Controllers, Machine Safety, Industrial IOT, and Electrical Panel Enclosures comprise the core of our expertise. HTE Automation serves the needs of industrial manufacturers in Kansas, Missouri, and Illinois.